If you asked me what a perfect day would look like, yesterday was certainly it. My day started off with a 3 mile run followed by some core work, push-ups, and at-home yoga. I didn’t have much time, but I cranked out this well-rounded workout in 40 minutes. 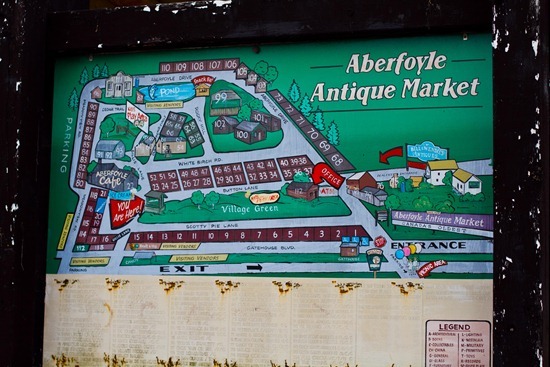 After showering and breakfast, Eric and I headed to the always fun Aberfoyle Antique market. It was supposed to rain all day, but it held off all morning. I love pleasant surprises with the forecast. 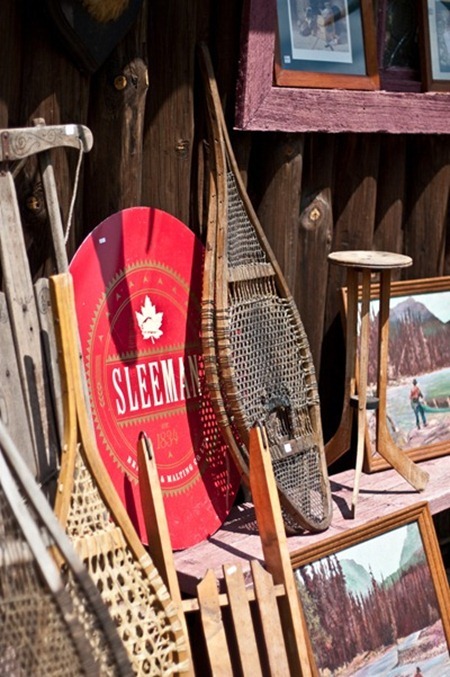 This antique market is huge and it has some great finds. Tons of gorgeous hand-crafted furniture, that is out of our budget right now! I got a bag of things for just $20! We ran some errands after that- Home Depot & Home Hardware for a couple tools for Eric and Whole Foods for groceries, lunch, and organic gardening seeds. 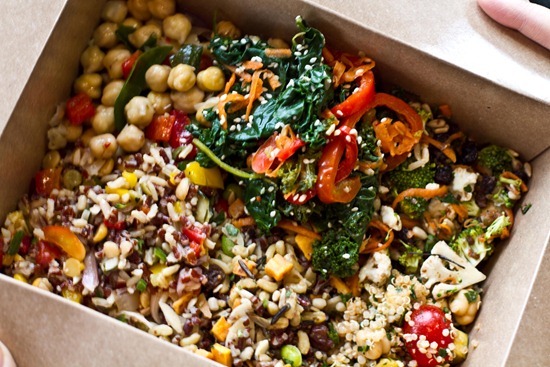 I had basically every vegan protein salad from Whole Foods that I could cram into my box. It was wonderful! Eric had a tomato & cheese pizza pie. It looked a bit weak to me! After that we hit up another nursery to finish getting the plants & pots I needed. The kale and such are not ‘certified organic’, but I was told the local grower doesn’t use pesticides. On the way home, the sun came out to reveal a beautiful, warm day! What a great long weekend this has turned out to be. 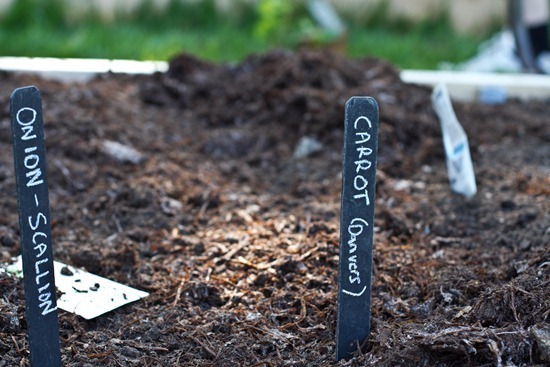 And then it was time to plant the veggie garden…it was G-day or bust. I got my trusty garden plan that I drew out after consulting Wiki’s info on Companion Planting. I tried to plant everything near other companion plants so they would have the best chance of surviving my black thumb!! My plan is all mucked up right now, but I hope to re-draw it and post it on the blog soon. Thanks to Karly, I had these wonderful stakes to use! The first thing I did was set the plants and bags of seeds directly onto the soil so I could visualize where everything was going to be on the two beds. I previously looked up the spacing requirements for each plant, so after I did this I got a ruler and roughly measured the spacing for each. It took me so much longer than I anticipated to lay everything out. At this point, our lovely neighbours came over and gave us a big barrel of local Mushroom compost! I moved the plants off, added some in, and then tilled the soil to mix it in. 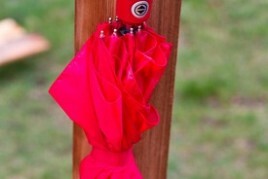 They also gave us that curly pole that we will use for our tomato plant. Apparently you can buy these at Dollarstore for much cheaper than Home Depot. We had lots of triple mix leftover which was a great thing because we needed it for the potted plants. Initially, we were going to put the 3 tomato plants in the beds, but we ran out of room (thanks to my little kale obsession). We moved the pots to a sunny area by the other side of the house. I checked and double checked my plan and tried to squeeze everything in! We had to place a few things closer together than we wanted to, but I’m sure it will work out just fine…or not. Do not be fooled by my smile, I have no idea what I’m doing!! Do you think I will kill everything? I sure hope not! I’m actually worried that these pots won’t be big enough for the herbs! What do you think? I also planted these Lilies in the front garden that were birthday gifts from Eric. Eric and the guys also finished the entire base of the deck on Saturday. I’m so impressed! There are 3 sets of stairs and all the railings left. Still lots of work yet, but it is coming along wonderfully. Around 8pm, we finally came in famished for dinner. I had no idea what to make, so I decided to just throw a bunch of things in a skillet and see where it took me. :) The best kind of meal, I say. 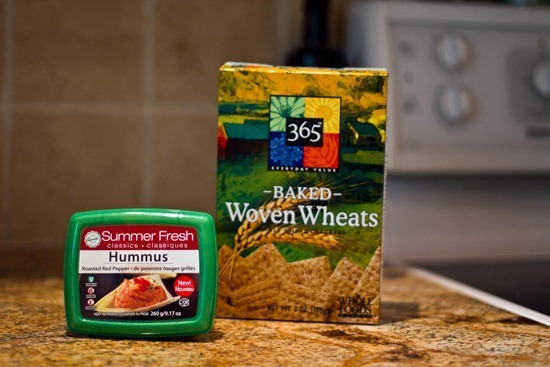 Appetizer was roasted red pepper hummus and Baked Woven thins (just whole wheat and salt as the ingredients). The first thing I did was cook a grain because that takes the longest. I cooked up about 3/4 cup of speltberries on the stovetop. Based on what I had in my kitchen, I decided to make a Speltberry chickpea veggie stirfry, infused with lemon, Thyme, and Rosemary. Check out the fun shot we got using the GOLD reflector disc. Eric held the gold disc to reflect the sun and it made for a cool picture in an otherwise dark kitchen. I didn’t measure anything, so the recipe below is a rough estimate of what I made. 1. Cook speltberries in a pot of water for about 25-30 minutes until tender, but still chewy. 2. Meanwhile, sauté the chopped onion and garlic in a a large skillet with some oil for several minutes on low-medium. 3. 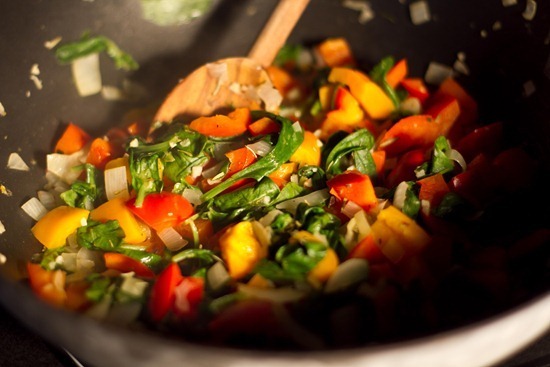 Now add in the chopped peppers and carrot and saute for another 5-7 minutes on low. Add in the lemon juice, Thyme, and rosemary and stir well. 4. Stir in the spinach and sauté until wilted. Now season to taste using salt, pepper, and optional Herbamare. 5. Stir in drained and rinsed chickpeas and cooked speltberries. Heat through and serve immediately. Season to taste. Makes 2-3 servings. In under 30 minutes, I had whipped up a great meal. I wasn’t expecting much from this, but we both loved it. The lemon, Thyme, and rosemary combo was lovely. On today’s agenda, we have more yard work to accomplish (I still need to weed the front and back flower beds) and we’re going to put some chicken wire around the garden beds so all our cute little bunnies around here don’t eat all my KALE!! Luckily, it looks like the weather will hold up again today. Tonight, we have a BBQ with a few friends to end the long weekend. It should be a good one. If you are enjoying the holiday Monday, Happy Victoria Day to you! What a perfect weekend im so jealous of your gardens, all of my plants are in pots and im so nervous I will kill them all. 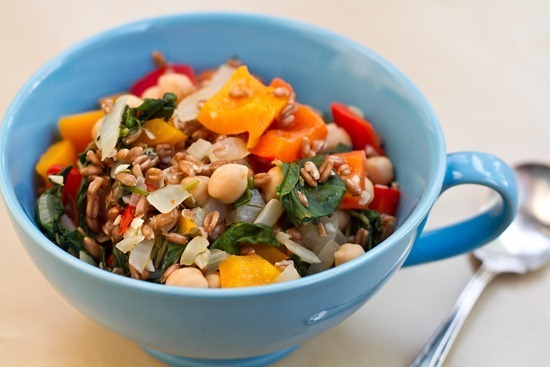 Your stir fry looks amazing meals I just throw together often end up being my favorites. Enjoy your bbq tonight and hopefully some gorgeous weather!! that sounds like a lovely day ended with the perfect meal! I love days like that :) Gardening can be a lot of work! I am tired just reading about it haha. I can see why this was a perfect day :) Have a great week — and Happy Victoria Day! Your garden/deck look beautiful! I have been wanting to start an herb garden myself for a while but I’m afraid to because I don’t have much space.. This post makes me think I still might be able to! Oh, andthe speltberry chickpea salad also looks amazing. We ran out of time this weekend to get planting and such done — hopefully we can get going on things this coming weekend! Good luck with your plants. I also have a black thumb and hope to turn it green this summer with my garden. 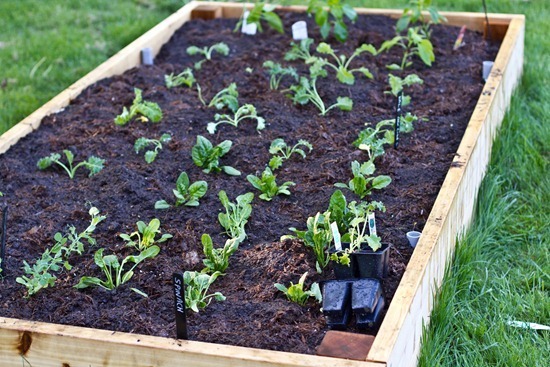 Your vegetable garden is looking great! That deck is really coming along too. Wow that really does look like a perfect day! I love yalls planter beds too…fantastic job! The garden is coming along so well! I’m happy to hear you had such a great weekend. 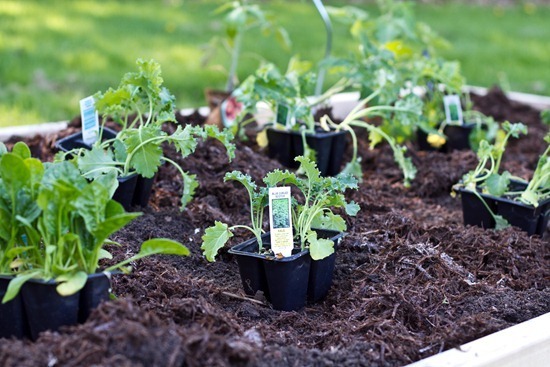 Did you end up finding the plants you bought yesterday as organics? Like the kale and stuff. They weren’t ‘certified organic’ but I was told that the local grower does not used pesticides :) From Jade Gardens I think it was called? We got a bunch of certified organic from taylor nursery and organic seeds from whole foods. Ahh, the garden is so exciting! I love my own little porch-garden, but I’m lusting after a yard with good sun. A word of advice for the pots: make sure the tomatoes have a LOT of root space, as they are greedy and like lots of room for their feet. I used big pots for mine. 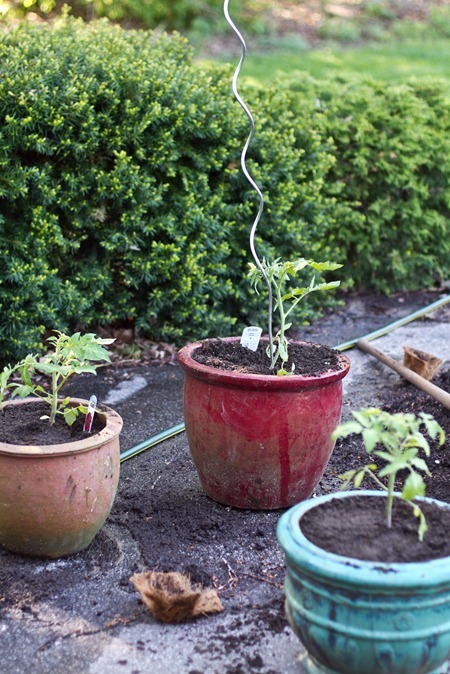 I have made the mistake of planting more than one tomato plant in the same container – don’t do that either! They’re very competitive plants and they won’t like that either :) They may grow seemingly okay at first in smaller pots but remember, if you wants lots of healthy tomatoes, they need lots of space! 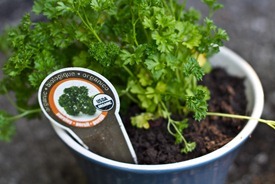 The herbs looks like they will be fine, they usually fill out wherever they are and they don’t have deep roots. My favorite resource for planting are the books Grow Great Grub and You Grow Girl, both by Gayla Trail. They’re SO good, and removed a lot of my own fear from planting my own food. 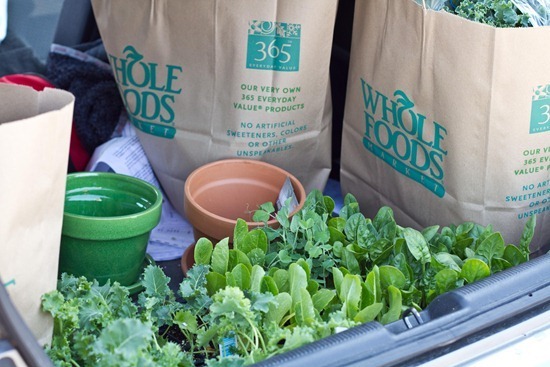 Whole Foods…gardening…it definitely sounds like a perfect day! My husband and I live in an apartment, so we obviously can’t have a huge garden. We did plan beets, radishes, jalapenos and onions in some planters last weekend. 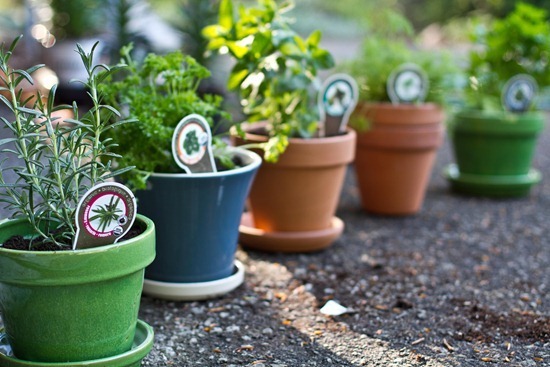 I love the mismatched pots your herbs are in. The diversity creates a strange unity. Your backyard is gorgeous already! Your garden is going to be beautiful! I’m jealous- I live in an apartment with a tiny porch that gets no sun. Last year we tried potted plants but nothing did very well… This year I purchased a CSA instead! This does look like a perfect day! 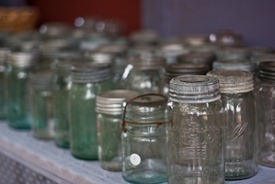 The antique market looks like a lot of fun, I’ve never been rummaging before. Glad to see this kind of update from you! Also wanted to add that it’s a dreary day where I am, and just working through some crappy crap at the moment and this post made me feel more sunshiney – thanks Angela! Oh, and mint supposedly takes right over, so maybe you will need a bigger pot? 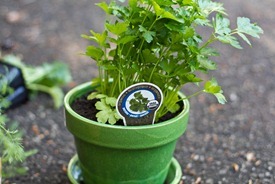 I need to start my tiny apartment herb garden soon! Your garden looks pretty spectacular so far! We’re planning on starting a garden soon and I was wondering what kind of soil / fertilizer you use. I wanted something animal-friendly and my Mom was wondering whether or not it would be ok to use manure in it. I wasn’t sure so I thought maybe you would know a bit more about soils and that sort of thing. The best fertilizer comes from animals: rabbits poop, chicken poop, cow/horse poop. I have a rabbit and put it straight into the soil! Seaweed fertilizer is also good. 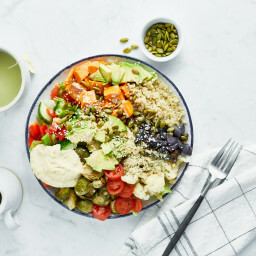 Looks like a fabulous weekend!…and this post has me craving a trip to the Whole Foods hot bar! These pictures are gorgeous! It looks like you had an amazing day! I love going to markets just to look even if I know I wont be buying much. I just started a tiny garden on the edge of one of our beds in our backyard. I’m so excited! I really hope it turns out well. My darling you did so well on your first planting trip!! I only wish I had a backyard (versus a balcony) so that I could plant my own. I guess this just means I need to be very discerning when choosing my plants haha. Btw – where did you purchase the Kale plant? I have fallen in love with kale but had no idea I could grow it myself. Again – small space means I need to be picky about what I grow. I figured I’d do two balcony boxes of flowers, some herbs (mint, oregano and basil methinks), two low boxes of ferns (like a hosta for greenery) and another few large containers with lettuce (they have a 3 lettuce blend at Loblaw’s but now I may need to go Kale!) and some strawberries. For any gardeners reading this, please let me know if I’m going about this the wrong way. And for you, darling, your garden will be fine! Just be sure to water and fertilize appropriately. 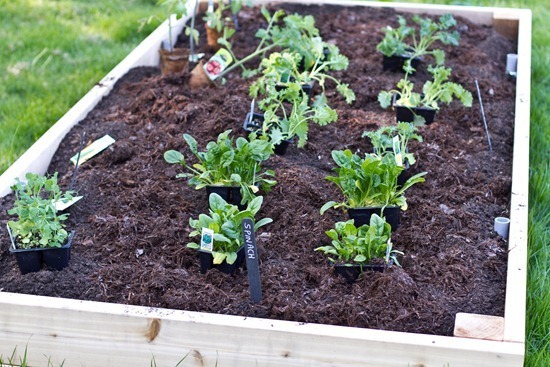 :) I can’t wait to see how awesome your garden will look in but a few week’s time! Hey there… I saw GINORMOUS bags of dried mango at Costco. Just thought I’d let you know! What amazing progress you’re making with the garden! 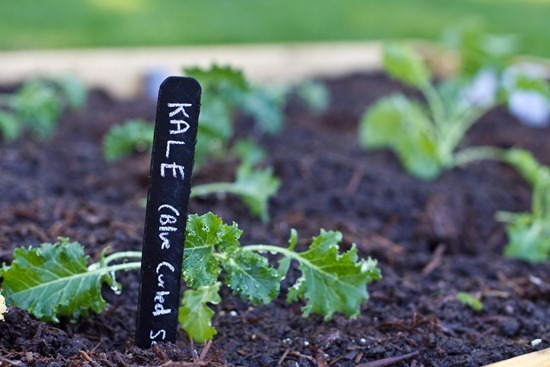 I love how much kale you planted…tons of new recipes this summer, I hope? 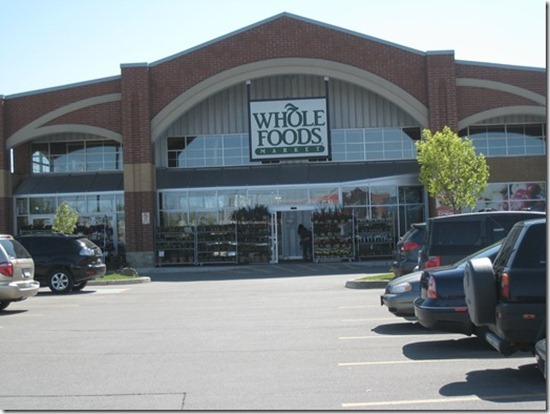 I honestly wished I lived closer to Oakville to have access to Whole Foods. I absolutely love it and need an excuse to be over that way more (grandparents live there…maybe I should visit more frequently lol). I’ve never cooked with spelt berries, but they look mighty enticing. 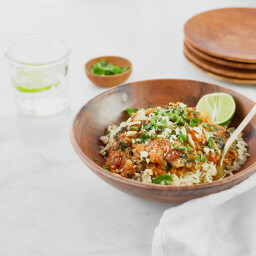 I love the randomness of just throwing together some items that you have – you’re right, they honestly make the best meals! I loved the weekend! The weather was beautiful! I wish I had a garden to plan (even if I also have no idea what I’m doing)! Great finds at the antique stoer! wow this garden sure was thought out well!! :) can’t wait to see is flourish! This sure does sound like the perfect day! Your garden looks great. I had herbs in pots, and they all died. I was told that the pots were too small, so you’d better keep an eye on yours! Then again, I don’t have a green thumb, and I manage to kill all plants. Probably even fake plants. 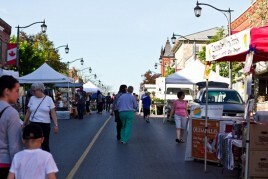 This looks like such a fabulous day, I love antiques and Whole Foods and great weather! And you look great in your photos, you definitely could pass as a gardening pro! That does sound like a perfect day!! I love when your expecting rain and it doesn’t come! I bett when your garden is in full bloom you’ll be loving it! O my, that salad looks amazing! what a great day! 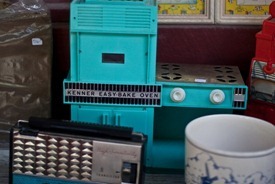 i absolutely love the old school antique mixer :) and i’m seriously very addicted to dried mango! WOW! Your garden looks great! Can’t wait to see the results of your hard work! You’re killing me with the gardening posts! I can’t plant anything until I move into my new house in about 3 weeks and I all I want to do is garden!! I always plant things much closer together than they say to, and it has always worked out just fine for me! And I have found that tomatoes do much better in pots, because you can move them to the sunniest spots and they are easier to cover when the nighttime temps dip below their preferred heat. The deck looks awesome too! What stunning photos! 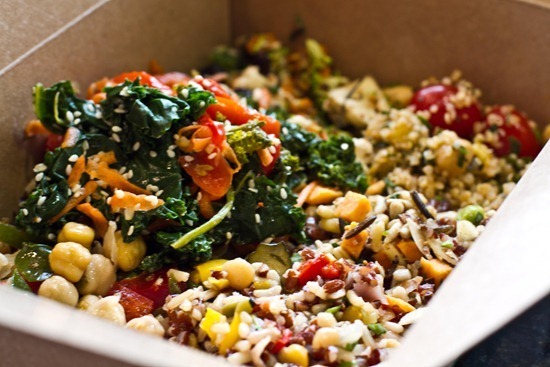 Looks like a weekend full of healthy doings, inside and out! Have a great holiday Monday!! 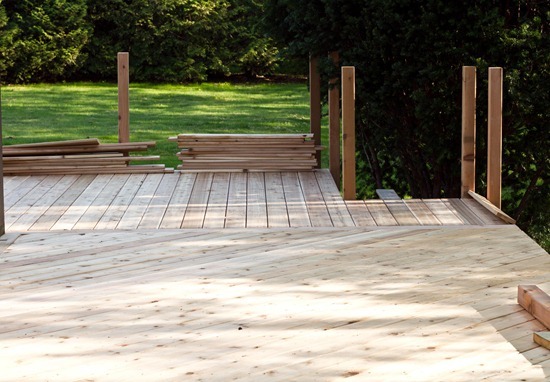 Beautiful deck – and I’m sure your garden will turn out just fine! Angela, you look so radiant in those pictures…I can really tell you’re enjoying yourself and doing something you love. That in and of itself makes it a perfect day, no matter what was on the agenda! I adore your garden! I live in the city, but have a terrace…I can’t wait to plant some herbs in a little flower box! Happy Victoria Day to you! What a wonderful day! Your gardens are looking beautiful so far. Good job! 20 kale plants!!!? Woohoooo! That’s awesome. I love kale so much. I’ve been gardening a lot too. It’s so amazing! Your deck, your herbs! wow are you getting it done lady! 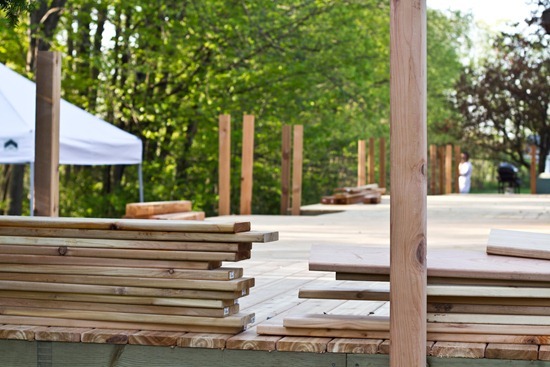 the deck is seriously going to be gorgeous! I wish I had a deck even 1/4th that size. good luck with gardening, it seems like a hobbie that would take a lot of learning and practicing but you seem to be doing well so far! i hope one day to start a vegetable garden, when I have my own home. it all looks great! I love your garden! 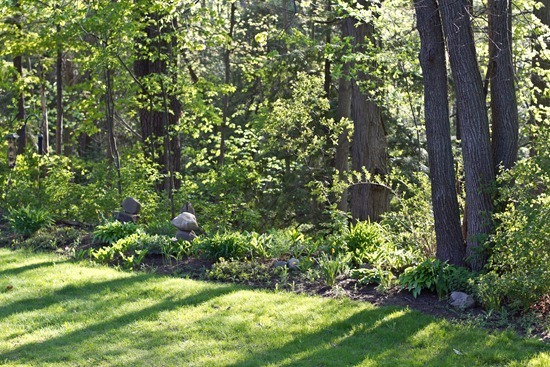 A backyard for gardening is one of the main things I envy homeowners for. That does sound like a perfect day. 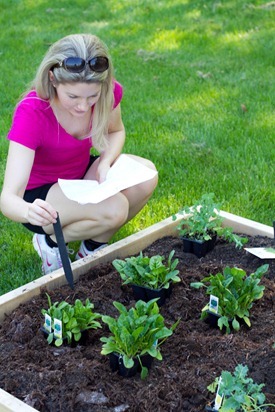 You put so much time into planning and planting your garden. I’m sure it will flourish! What a fantastic weekend! Beautiful weather and outdoor adventures! Your garden looks so beautiful – i’m on the verge of dusting off the gardening gloves myself so this is inspiring! The garden looks amazing!!! I also have a black thumb, I always kill plants in the house.. but last year I had my first garden and it went great! Just make sure it’s watered every day and that’s all you gotta do! Goo luck with the garden, it looks like a blast! What a great weekend! I love going to flea markets. They have the best stuff! PS doing an awesome giveaway today, you should check it out!! Wow, what a busy day! 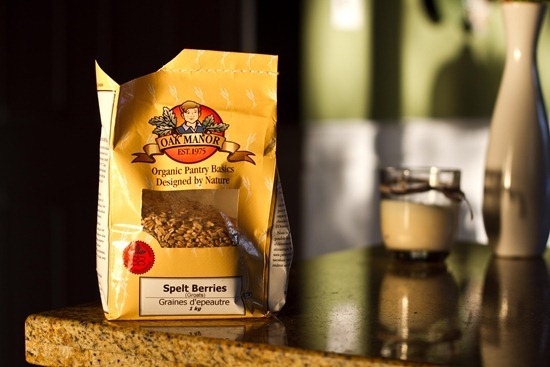 I am intrigued by the live granola from Whole Foods, and I can’t wait to see your recipe! Your garden is so organized! I managed the nice little rows, but there was no planning :) A row of carrots here, some kale there… My lettuce is suffering. It’s just too cold still! However, the peas poked through yesterday and I am super excited. Happy gardening! Oh man! I’m totally jealous of the deck! It’s huge! 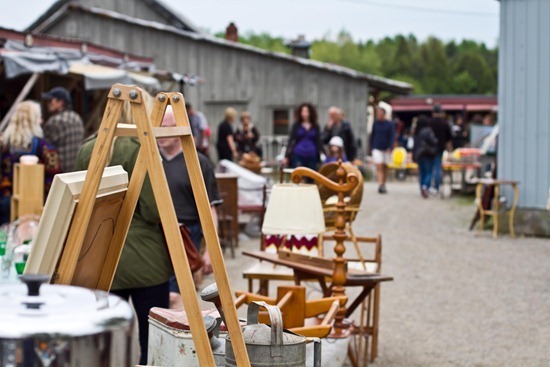 I love antique markets and thankfully I can always shop there with clear conscious as it’s part of my job ;-) Love your veggies patches as well and the stir-fry is a must try! This is such a cheerful post! I don’t think I’ve ever commented here before, but just want to tell you that I love reading your blog. You take such beautiful photos. And I LOVE reading about your garden progress! We just moved and our current situation won’t allow me to plant a garden for awhile…..so I am living vicariously through you. lol. Ps- I saw several Green Smoothie recipe books this weekend, reminded me of your Green Monsters!! Very cool! Wish I had more room for a veggie garden. I had a small area, but it has now been taken over by my raspberry bushes. Not necesarily a bad thing though…i LOVE me some raspberries. 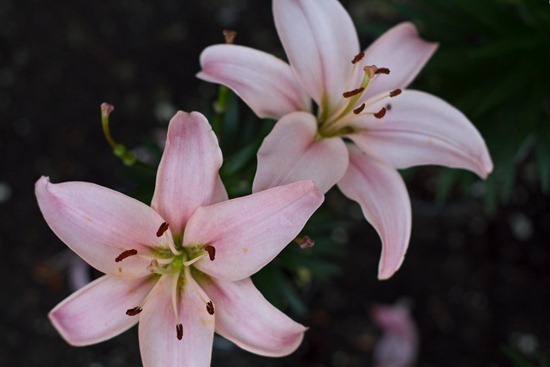 Oh, and a little forwarning about lilies. You will find they will be overtaken by some little red bugs that will literally eat it to shreds. I’ve tried different things to get rid of them (all organic), but no luck. Only way to do it is to pick ’em of by hand and there’s no way I was doing that! oh no I saw a red bug on one yesterday! Thanks for the tip…will have to check them out. 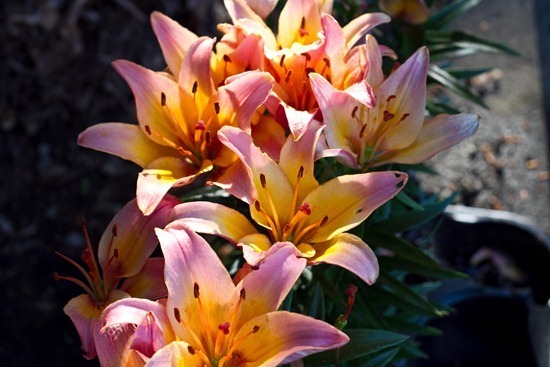 Thought I’d link you to a blog post I did about my lilies last year. http://outnumberedbykids.blogspot.com/2010/05/bugs.html This was just when they started to eat away at it. You should have seen what the poor plants looked like after a few weeks. More holes than plant. I couldn’t think of a better day to be called ‘perfect’! I am totally jealous of your deck! 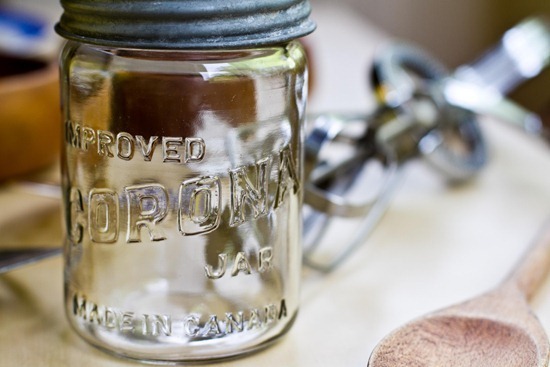 It’s going to be so perfect for entertaining! 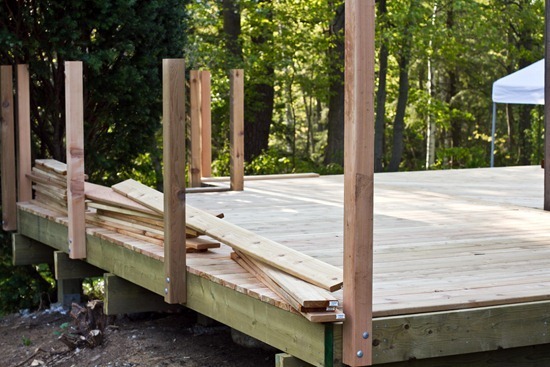 The deck is looking great – and what a great idea to find little items for photos!! so smart! How long does it take you to run 3 miles? To get all that in just 40 minutes?! Hi Angela! I follow your blog everyday! I am a huge fan. You are very inspirational. I LOVE the Whole Foods vegan salad options at the Salad Bar! They totally make my day (and give me yet another reason to visit Whole Foods)! Hi. I only recently found your blog. (I guess I am late to the party…) Nevertheless, I LOVE those garden stakes. So perfect. Great job on the Garden- I absolutely LOVE the plant markers, can you tell me where they are from- the link doesn’t seem to be working; thanks! I agree! I love the versatility of them and would love to purchase some! The garden and the deck are coming along nicely! 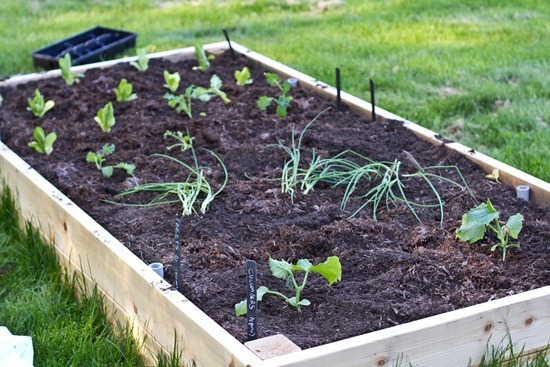 You are going to have so many nice fresh veggies! I’m a bit jealous! I know you get this all the time, but I just love your blog! You inspire me to be a more witty blogger, a healthier eater, a creative photographer and a pursuer of my passions. You do seriously amazing work. You are way braver than I am. I don’t put my black thumb towards anything plant related!!! Ha. wowza! A perfect day indeed! It looks like you had a very fun day! I hope to be able to start my own garden up soon. 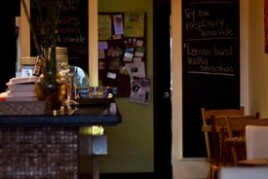 By the way, last night I tried a restaurant called True Food and had a kale salad that was so good! We asked the server if he could divulge the recipe and he said it was online. Here is a link to it if you’re interested–http://www.truefoodkitchen.com/recipes/tuscan-kale-salad.php Seeing your kale plants reminded me! I’m sure you could either omit the cheese or use nutritional yeast. He said the trick was to let the lemon mixture sit on it for about 20 minutes before you eat it. Your garden looks great! I am surprised you crammed so many kale plants in there! I planted lacinato and red russian kale seeds this weekend and they needed to be 50cm apart! Can I just tell you – you have like my DREAM days? I wish I could go antiquing and visit Whole Foods and then go plant and play in my garden! Lucky woman! Your garden looks BEAUTIFUL! I can’t wait to see all your fresh produce. I’m so jealous…wish we had the space to grow something…anything! Sounds like one heck of a day to me!! The garden is looking lovely!! lovely garden!! I wish I had a backyard to grow my own produce. I have tried once doing it in pots, but failed. Maybe I will give it another try. Great garden! 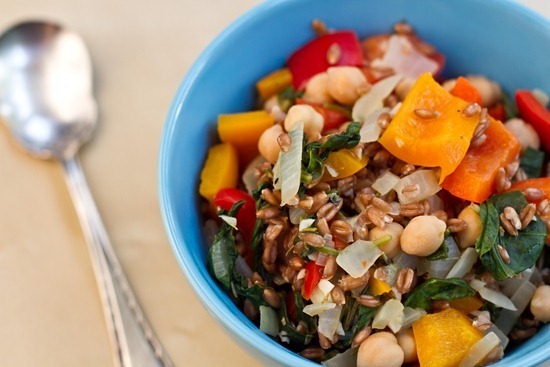 You’ll love it, especially the first time you take a vegetable from it! Companion planting is great, I’m glad you’re starting with it…I found a great book called “Soil Mates” that is perfect for help with companion planting. You won’t kill everything…promise! Just check on the plants each day, and add water as needed. You’ll rock it!! Gorgeous deck! Way to go guys! I don’t think you’ll kill everything in your garden. I’d like you to come to my yard and make mine look that pretty, but it’s not going to happen so I’ll just hope that I don’t kill anything. I can’t wait to see how the kale turns out. My WF doens’t have sweet frozen cherries either. Sad. Just started following your blog over the last few months, love it!! 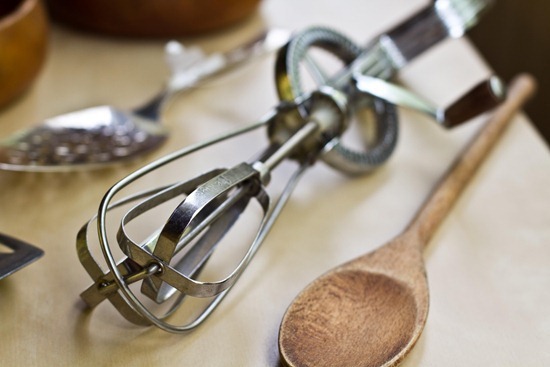 I have tried a lot of recipes and all are great. You could almost turn me into a vegan except my boys would not give up meat. 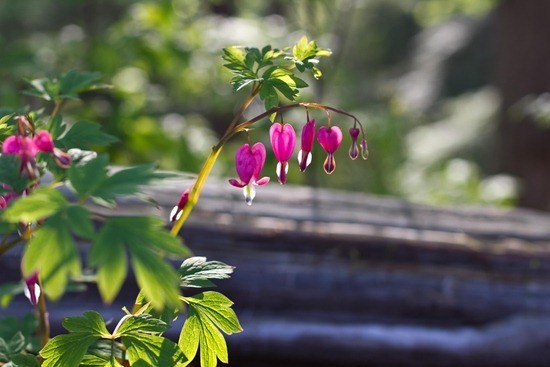 Love your garden, where in Ontario are you? 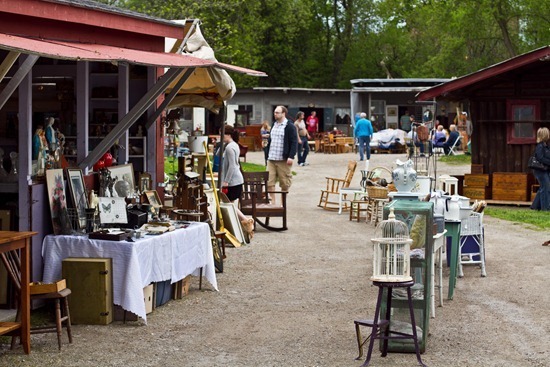 Two things I’m jealous of: 1) I wish/wonder MN had an antique market! How would I go about finding one? 2) I want your gardens!!!!!!!!! And I LOVE the lillies! OMG ideal weekend!! I love gardening!! Rosemary – 2 plants 1 x 20cm diameter and v deep terracotta pot (cone shaped almost), 1 x 28cm diameter normal terracotta pot. 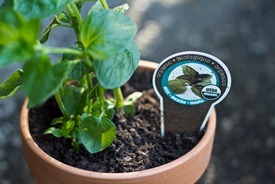 Basil needs a wider pot rather than a deep pot, use those shorter squat terracotta pots with a wide opening. I think mine is 35cm diameter? You can plant about 3-4 plants in those successfully and that will give you A LOT! 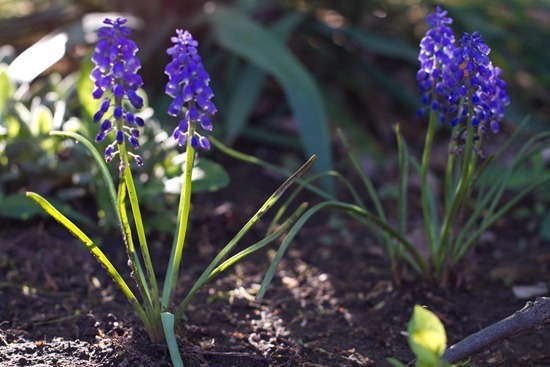 Make sure you pinch off the tops when they reach about knee height to encourage the plant to grow bushy rather than high. Also stops them bolting to seed as easy. 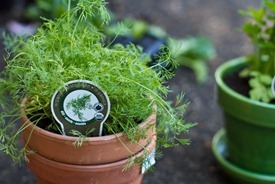 Parsley – 1 x plant in a 28cm diameter terracotta pot. I’d also urge you to get oregano and thyme! Thyme is one of my favourite herbs! Hey. I just found your blog and your posts and story are so inspiring! I think I’m here to stay! P.S. : And oh do I want that Sleeman’s sign!!! Yay for the veggie garden. It’s going to look amazing when everything has bloomed. That is my idea of a perfect day, too!!! Wonderful! I grow lots of veg too, just planted up the greenhouse yesterday…I say grow…I mean intend to grow ;-) My favourite companion plants are calendulas, nasturtiums and tagetes (tagetes are supposed to be especially good near tomatoes to keep the pests away), and they are all so pretty and soooo easy to grow! Good luck with you veggie garden, I look forward to reading your updates! I just built a garden over the weekend too!! I can’t wait until all our hard work starts paying off with some fruits and veggies!! 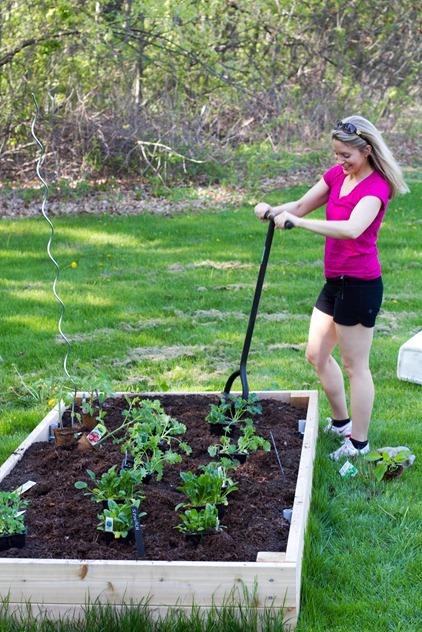 Growing healthy food for you and your family is a truly rewarding experience. I have grown a “kitchen garden” for many years and most everything I have learned (of value) has been from trial and error. And there is nothing more devastating that cheering on a plant only to have it fail, they become your little babies! Which is why I feel compelled to tell you, those tomato plants are in MUCH too small containers. The twisty poles might look great as supports, but in my experience, they do not truly support a strong growing indeterminate variety tomato plant. The Beefsteak variety fruit can be over 1lb, they need help holding that up! 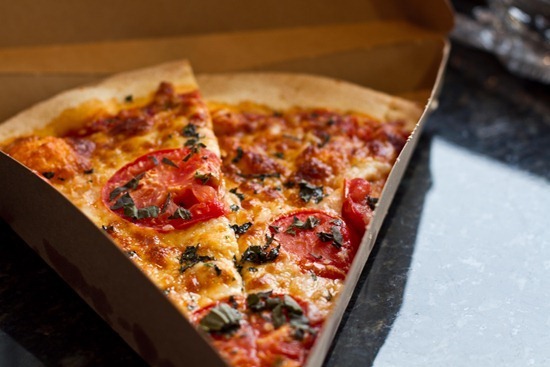 Remember, tomatoes are vines and need deep strong roots to support their continuously growing upper bodies. Your planters look great now, but will not support healthy plants that produce much fruit. Read up on tomatoes, I always find it helpful to read about each variety you are growing, not just general tomato plants. 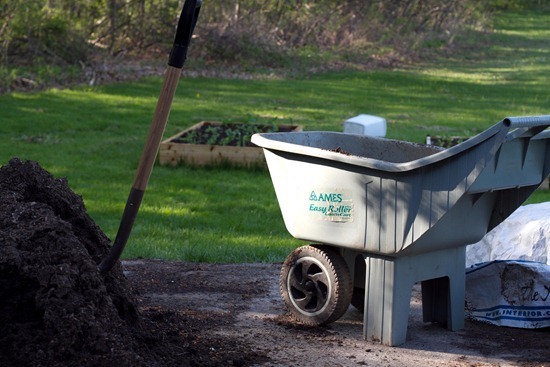 I learned a great deal about different types of fertilizers and composts (I grow organic, too!) about pruning your plant to keep its energy towards fruit production, and about the best way to stake and support them. It is heartbreaking to realize you planted them in containers too small, only to try and move them and find out you disturbed their roots too much to bring them back to full production. Also, plant them deeeeeeep. The plants will sprout roots all the way up the vine, so replant them in a larger container, rip off the first few sets of leaves and plant them deep down, always prune the “suckers” that grow in the arms of the plant (but never any flowering branches) to focus energy on fruit, not foliage, and side dress with compost tea or other organic fertilizer when then begin to flower and then as they need it. the Good luck! Thank you so much for this helpful info!!! I appreciate it very much. I dont think you are bullying me at all…haha. Id rather tips now than later. I will be on the hunt for bigger pots- probably for the herbs too. 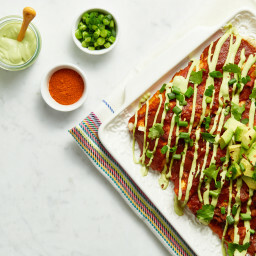 Really enjoy all your recipes and posts, so glad to help! I just looked at your pictures again, I am not trying to bully you at all, I just have had so many failed plants for not knowing exactly what to do…and it hurts when you lose them! Peas need something to climb, they are also vines. Same with cucumbers and beans. Cucumbers will blow your mind just how much the grow and spread, their little tendrils reaching for whatever they can grab! And you will probably want to stake your pepper plants as well. Well staked plants don’t have to struggle under their own weight, therefore they can focus more on fruit production. Great garden update with excellent photos of your progress. I’m sure your gardens will do well. 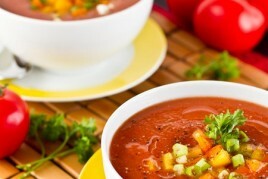 You most certainly will have an abundance this summer. Enjoy! Your garden looks GREAT! You might have to keep an eye on those herbs though, they tend to grow pretty fast (and this comes from someone with definitely not even a hint of green fingers).